Max has been snatched from Jemima again! Who is it this time? Why now? Max's Undercover Adventure by Wendy Leighton-Porter is an brilliant children's adventure short story. Max wakes to find himself being thrown into a van with another talking Tonkinese cat, Clio. Max is dismayed to discover that he is in for another long adventure. This time, he and several other animals have been driven to an undisclosed location. What do they want? When Max demands to be taken home, he is denied. He is informed that he is needed. The Guardians of Time have requested his presence. What do they want with him now? 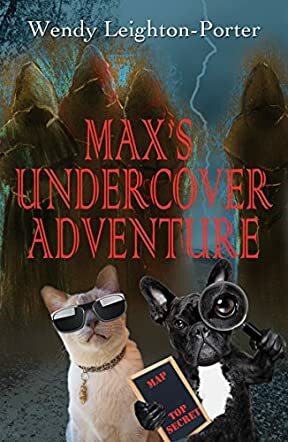 Max's Undercover Adventure by Wendy Leighton-Porter is the delightful fourth book in the Max's Adventures short story series and the perfect companion to read before picking up The Shadow of The Tudor Rose from the Shadows From The Past Series! I love how Max's Adventures coincide with the Shadows From The Past series. The short stories are just short enough to encourage children to want to read more, without overwhelming them. I believe that this series (and book!) are an excellent way to boost a child's desire to read while giving them the confidence and curiosity to pick up the longer Shadows From The Past books. Wendy Leighton-Porter has created such exciting adventures full of educational value; parents will be thrilled that their children are learning and children will be begging for more adventures to get lost inside! I would recommend this book for children ages seven to eleven.